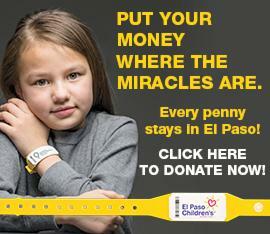 El Paso Children’s Foundation awarded a grant of $8,800 to El Paso Children’s Hospital to expand their lactation preparation room in the Neonatal Intensive Care Unit (NICU). “Before the expansion, our formula techs were fixing the feedings for the babies in a 54 square room, so you can imagine how tight it was,” said Amanda Timmerman, Clinical Nutrition Manager at El Paso Children’s Hospital. "The refrigerators and freezers were in another room and this made it difficult and time consuming for the formula techs to bring the breast milk and donor human milk from one room to the other," adds Timmerman. "And if the formula tech ran short of something then they would need to leave the room and enter another room where the freezers and supplies were." “Newborns and premature infants feed every three hours,” said Cristela Avila, Formula Technician at El Paso Children’s Hospital. “So having to go into one room to get the milk, leave that room and enter another room to prepare the feedings was time consuming." Now, thanks to the grant from El Paso Children’s Foundation, the feeding preparation room was expanded into one big room where the formula technician has the milk freezers and supplies right next to the preparation counters. This room meets the guidelines with the Academy of Nutrition and Dietetics. The entry way leads to a sink that is hands free for formula techs to wash their hands without having to touch anything. They put on their gloves and go directly to the freezers that are in the same room. They can prepare the feeding and take it straight to the babies. 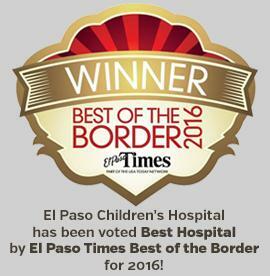 “We are the only hospital in El Paso that has a preparation room like this and is because of the grant from El Paso Children’s Hospital Foundation. Thank you,” said Timmerman. This grant was awarded to the food services department at the El Paso Children's Foundation Volunteer Congress in 2016. Currently, Volunteer Congress actively is raising funds through a program called Change for CARE.